#1 Why Biometric Gun Safe is a Smart Choice? Burglars have always found ways to break into the gun safe, through specialized tools. They are also able to find out password combinations. Occurrence of such types of incidents has leaded both users and manufacturers towards more advanced type of locking systems. Right now, most reliable gun safes have biometric locking system. Biometric technology uses human finger prints or retinal scans as an identification and unlocking system. At the time of purchase, the user’s fingerprints and scans are taken and fed into the system, after which only the owner of the safe can open it. There is no other way for the lock to open, as human body is unique to each individual person and cannot be replicated. There are a number of advantages in purchasing and using a biometric gun safe. It will add a sense of security to anyone’s life. Users can be sure that their guns are safe inside the biometric lockers, which protect valuables from calamities, fires, water and theft. Newer biometric systems are easier to use, produce the least amount of recognition errors and are made of solid metals that cannot be broken with force. Here are the reasons why it is better to purchase a biometric gun safe rather to choose a mechanical or electronic locking system. While many argue that manual locking mechanisms are better, the fact of the matter is that technology is advancing and things are improving. Biometric locks are often faster and they can even go into a state of total lockdown. This will make it nearly impossible for an intruder to get through the lock and in most cases, they will give up. While many people may rely on the standard shell and safety features provided by traditional safes, biometric safes will ensure that you have extra safety. It has been tested and found that intruders will take up to three times longer to pry their way into a biometric gun safe on full lockdown and technologically advanced locks will provide a much more reliable locking feature than traditional safes. Biometric safes help users to avoid the fuss of keys and recalling passwords. Keys and passwords are a thing of the past now. Even smart phones unlock with the help of a finger swipe. Safes, are operated in the same manner, they can be unlocked and locked in the matter of seconds. This gives the user quick access to their possession, once retrieved, the door can simple be locked shut. The door thus, automatically shuts itself till the user scans their finger or retina. When you are caught in a dangerous situation, it could really make the difference between life and death and you will not want to put your family’s life at risk. Most of these safes also have an added gas strut or hydraulic opening system. This will make it even easier for you to access your firearm and always be on guard. Biometric safes belonging to each individual user will use only their body scans to customize the locks. The locks can also consist of combinations of mechanical and key systems, along with the biometric recognition. This will increase the safety of one’s belongings and make it a difficult task for anyone trying to gain unauthorized access. These are used by defense agencies and they are extremely difficult to get a hold of. The biometric scanners generally cost a lot of money, but they will make sure no one can enter. Moreover, biometric safes come in different shapes and sizes. The biometric lock has really improved the imaginations of safe designers and they are able to use these smaller locking systems in more versatile shapes and sizes that can be mounted nearly anywhere. I recommend choosing a shape that is not only fancy but will also provide you with the adequate security needed to ensure that everything is safe. There are a number of gun safes with different mechanisms for the security in them, like the code lock, hand lock etc. There is one more method which is the most efficient of all and that is the biometric way. Biometric is being adopted in a number of gun safes as this is the strongest way of security. It cannot be stolen, like the code locks neither can be broken like the traditional locks. Biometric gun safes are the most secure devices with highest level of security possible. Biometrics is the science of locking mechanism using the human finger impressions. We all know that every human finger impression is unique and it cannot be matched or copied with any other human being. That is why; it is the strongest and most reliable and secures way of gun safes. By locking a gun safe with one’s finger print impression, there is no other way of unlocking it other than placing the same person’s finger print impression. No matter what, there is other way of breaking out this lock. If a safe is not powered in some way or another, you will need to add lighting manually to see what is inside and you might also need to use the torch if you cannot find the perfect lighting, but most biometric safes do have their very own internal lighting features to make life easier for you and to ensure that you can find what you need. Our mind generally remembers things that we see or come across a lot and with keypad safes, the backlit keypad is required for night use, but this can put strain on the safes battery and you will need to fork out a few bucks every few months to replace the battery. With a biometric keypad, this will not be the case and it will be much easier to ensure that the safe is ready to access. If you cannot remember where the scanner is situated, you can simply just feel where it is and scan your finger, thus gaining fast access. 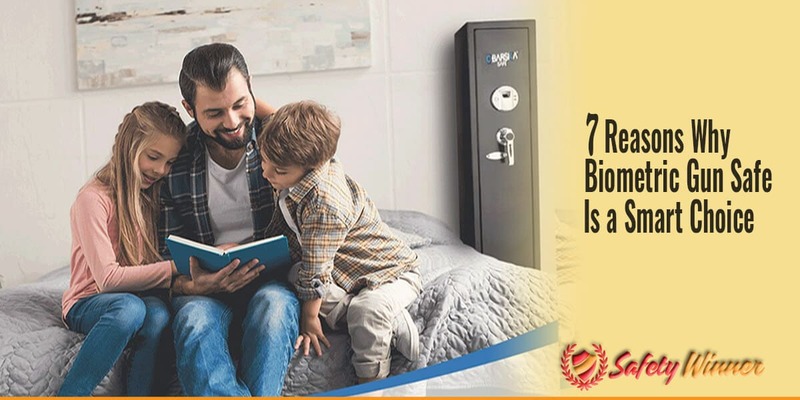 Biometric safes are built to be childproof and some of them even have built-in notification systems that will make a loud noise when someone is tampering. These safes are codeless and your children will not be able to accidentally see the code and gain access to the weapons inside as this can be really dangerous. Biometric safes can be accessed via an app and most of them do have a tamper control installed. This means that if someone enters the wrong finger for too many times, the safe will shut down and you will need to open it with the added manual override key. This might not be ideal when it comes to a malfunctioning scanner but it does add another element of security to the overall structure of the safe. Safes do this in general, but having a faster access safe with advanced security features and tamper alerts will definitely improve the peace of mind you have. Now you will be able to have a comfortable night’s sleep without having to fear that you could be caught off-guard and that the children might do harm when accidentally opening the safe. It definitely is worth to spend the extra amount of money upfront and in this age, you cannot really put a price on the life of your family and your own. Biometric gun safes are essentially one-time investments and I believe in using them for personal or office use. It is just important to make sure that the safe is concealed and that it is kept away from children.